I never went to sleep away camp. This was a source for much consternation since I was a fan of the summer camp oeuvre such as Meatballs, Dirty Dancing, and, uh, every horror movie ever made. Adding to my chagrin was the fact that I spent my summers split between grandparents in southern California and New Jersey, the latter being a place where all children apparently are sent away to frolic in the bucolic countryside. Suffice it to say, I loved Wet Hot American Summer and am anxiously awaiting its Netflix exclusive prequel series, which will start streaming on July 31st. Who doesn't want to see Paul Rudd in copious denim and Christopher Meloni with feathered hair? They're making the memories I never had. Which, in retrospect, was probably a pretty good thing. 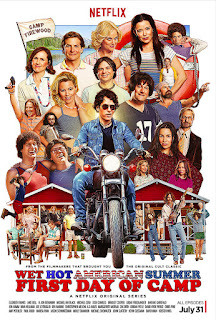 From co-creators Michael Showalter and David Wain, Wet Hot American Summer: First Day Of Camp is the prequel series to their 2001 film that became a cult phenomenon. While the film took place on the last day of camp at Camp Firewood, the series takes place on the first day of camp, back in 1981. The series consists of eight half-hour episodes. Wet Hot American Summer: First Day of Camp. The best summer of your life starts July 31 at 12:01am PT only on Netflix. Follow #WHAS on Facebook, Twitter and Instagram.